Using a powder coated steel frame, Blow mold PEVA counters and full digital 500 denier polyester panels and umbrella. The fast set up and storage size makes this perfect for patios, BBQ’s and tailgating. Unfold the frame completely, being careful not to pinch your fingers in the process. Place each shelf on the frame as shown here making sure to match each shelf’s notch with it’s respected frame part. Now that the frame is up and shelving is in place it’s time to velcro the polyester panel up around the frame. At this point you may also insert the drink cooler into the middle shelf with the rectangular hole in it. 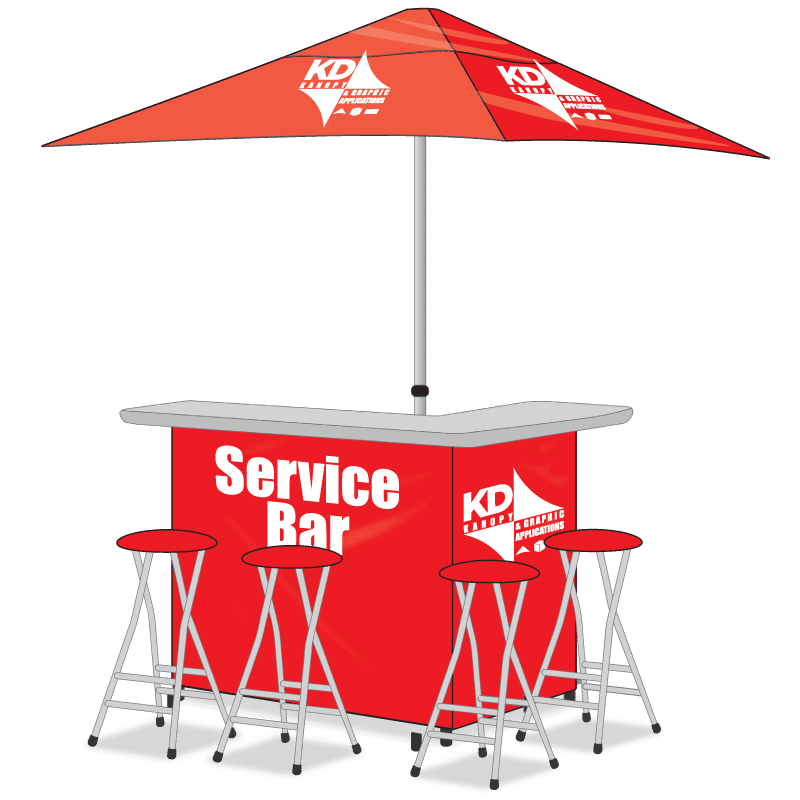 Unfold and place the polyester umbrella on the ground with the graphics facing down. Put the “top” of the umbrella pole in the center of the vinyl and open it, guiding each pole toward each of the four corners. Expand each of the poles to the corner pockets making it taut and then lock them down. It’s best to work opposite corners instead of clockwise or counter-clockwise. Now that the umbrella is built you can place it in the bar’s sleeve.